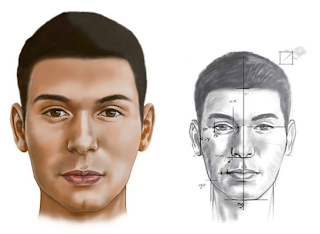 Dienekes’ Anthropology Blog: Facial composite of "global human"
The article is a bit vague and non-specific (it is from a popular science magazine, after all). They say they've calculated a weighted average, with the data points from highly populated countries contributing more to the averages than others. That's all the information I could get from this snippet.. They also don't cite the study they took their morphological data from. And what can it mean this "study"? De lengte van het oor, de breedte van de ogen, de hoek van de neus, de hoogte van het voorhoofd: in totaal 16 kenmerken werden bij iedereen in kaart gebracht. Per land werd per kenmerk een gemiddelde berekend. The length of the ear, the breadth of the eyes, the angle of the nose, the height of the forehead: in total 16 characteristics were measured from everyone. An average was made for every characteristic in every country. I think it has one accomplishment: showing that the average of humans has no resemblance to any population from the pre-1492 world, thus proving that hybridization doesn't bring about familiar types but usually previously unknown types. But I think these were already obvious from the existing hybrids. Looks like an admixed African American to me. The specious appeal of this image is that it seems to imply "the face of the melting-pot future". 2) genetically dominant not just in the Mendelian sense but in the epistatic and extended phenotypic sense. Looks quite a bit like this guy who has a similar, real life, heritage. Another famous composite face is that of Betty Crocker, the trademark face of a leading cookbook. "I think it has one accomplishment: showing that the average of humans has no resemblance to any population from the pre-1492 world, thus proving that hybridization doesn't bring about familiar types but usually previously unknown types. But I think these were already obvious from the existing hybrids." Good point I hadn't thought on that. The real question is whether that would be the more typical result if populations hybridized. When populations mix do they average out all characteristics evenly. Even though the Guy has an averaged face (this time of different races) he is not attractive IMO, but I guess he could be slightly above average. Come visit Hawaii, we are all around. The real question is whether that would be the more typical result if populations hybridized. When populations mix do they average out all characteristics evenly. Good question. Well, even though the authors of the study took the "human average" based on the number of inhabitants in the tested countries, they also should have taken into account genetic factors like gene dominance in certain traits. Still, the high number (1470 people) of the surveyed individuals must have lessened the impact of genetic factors and rendered the average a fairly realistic average of the surveyed countries. "Do only 25 countries represent humanity" is another good question, but I think if the countries were chosen carefully they may to a large degree. The urban legend that hybrids are more likely to be attractive than pure people has never been proven, so I see nothing surprising in the "human average" being ugly. One of the big factors in perceived attractiveness is facial symmetry which can be as present or absent in a "human average" person as in someone of monoethnic lineage. With regard to "the face of the melting-pot future." This certainly isn't the case everywhere, but there are certainly places, like California and Peru, where this is very much of the face of the future. It would be interesting to look at the map and pick up the hot and cold spots of admixture in today's world.